Beautiful Dry, oaky, nutty, fruity. An amazingly good rum.....excellent bottle, excellent liquid. Every collection NEEDS this! He never fails Another great example of why Rums produced by Foursquare Distillery are of a consistently high quality. Great flavour, great price, no added sugar. Great flavour Pot Still underpins this Jamaican offering and for me, makes it my go to for Rum and coke. very tasty Very nice, well balanced Rum with heaps of flavour. Enough to keep your interest for sure. A touch sweet but an easy to get along with drink. Always in stock Wonderful with coke.....drinkable on it's own. You should never allow yourself to run out! 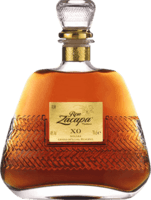 Different With flavours and aromas of chocolate, malt, peanuts and coffee, this Rum is a unique one for sure. Makes a great old fashioned and is tasty neat. Excellent mixer Mixes very well with cola. Cheap and is a good mixer. Lies in a bottle Sweetened spirit with spurious marketing claims and very questionable age statement.